Long Tail Versus Short Tail Keywords Keywords can be split into two main groups, short tail keywords and long tail keywords, or broad keywords and narrow keywords. The term ‘long tail’ was coined by Chris Anderson and is used to describe the strategy of targeting less-competitive niche markets rather than the hugely competitive broad keywords. A long tail keyword is something like ‘Small Business Web Design’ while a short tail keyword is something like ‘Web Design’. When you compare the two keywords, ‘Web Design’ has about 30 times as many competitors as ‘Small Business Web Design’ but ‘Web Design’ also gets far more searches each month. A small number of broad terms such as ‘Web Design’ and ‘Marketing’ account for a large proportion of searches but an equally large proportion of the searches are made up of millions of more specific search queries such as ‘Small Business Web Design’. 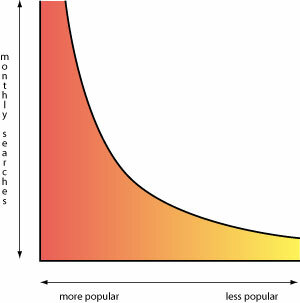 This search distribution can be understood through the following graph. 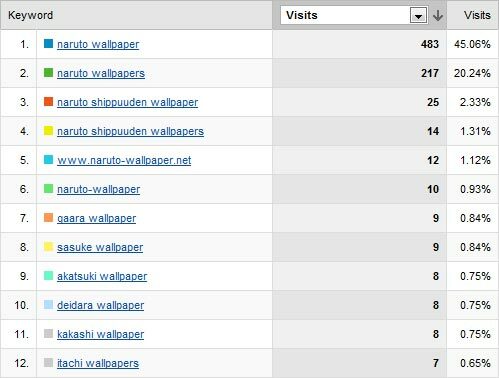 I speak about www.NarutoWallpaper.biz a lot and I will speak about it again in this article, each day NarutoWallpaper gets over 1000 visitors from search engines from roughly 200 unique keywords but the best keyword brings almost 50% of those visitors, following is a list of the top 12 keywords. Notice that the first keyword brings 45%, the second keyword brings 20% and the remaining 198 keywords account for the remaining 35% of the searches. 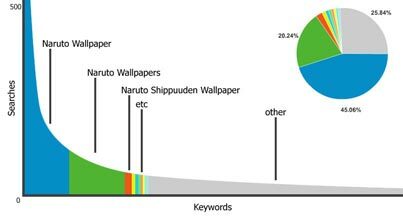 This distribution seems very similar to the graph I displayed earlier, the top few keywords account for a lot of the searches but there is many, many more specific searches which cumulatively total a significant figure. Let me display the keywords in graph form. You can see that the top two keywords bring in lots of traffic and the remaining keywords each bring minute amounts of traffic that cumulatively totals a significant amount, but separately are not significant. You may be wondering why anybody would want to target hundreds or thousands of keywords which bring only small traffic. Well the answer is simply that there is less competition so you can rank on the first page of Google for long tail keywords far easier than ranking for short tail keywords. Yes, they don’t bring a lot of traffic separately but if you target lots of long tail keywords you can get lots of easy traffic. Not everybody is capable of ranking highly for highly competitive keywords but anybody(!) can rank for long tail keywords. Another benefit of long tail keywords is that the visitors convert amazingly well to sales and ad clicks. The visitors searching for long tail keywords know exactly what they want, be it ‘Small Business Web Design’ or ‘Half Price Armani Suits’, they know exactly what they want and hopefully you can provide it to them. To put this into numbers, in general my websites might make $5 per 1000 impressions but from long tail visitors I can earn $100 per 1000 impressions, that’s 20 times the revenue if the traffic is equal. Although admittedly the traffic is not equal, my best keywords bring in more visitors than the long tail keywords combined, but the long tail keywords still bring in nice revenue. On this website I have two pages providing free business resources: Free Business Card Templates and Sample Marketing Plan and Marketing Plan Template. Both are targeting long tail keywords such as ‘DJ Business Cards’ and ‘Massage Business Cards’. Those two pages make a lot of revenue per 1000 impressions but currently have low traffic. The keywords I am targeting are very specific and the visitors are getting what they came for so they convert well. Whether you can achieve high rankings for competitive keywords or not, long tail keywords could be highly beneficial for you. If you have a website selling ‘Armani Suits’ but can’t pull any search engine traffic, rather than targeting the keyword ‘Armani’ or ‘Armani Suits’ try targeting more specific keywords such as ‘Armani Mens Suits’. Hopefully you will see an increase in conversions and sales.